Halifax: Public Archives of Nova Scotia, 1979. 23 consecutive issues The Nova Scotia Historical Quarterly became the The Nova Scotia Historical Review in 1981 and started renumbering from that point on. This run starts with Volume Nine, Number 3 (September, 1979 ) thru Volume Nine, Number Two (1989).. Wrappers. Good. 8vo - over 7¾" - 9¾" tall. New York: Random House, 2005. Near Fine/Near Fine. First edition. Fine in fine dustwrapper. Inscribed by the author to another poet. 2002-09-17. New. Ships with Tracking Number! INTERNATIONAL WORLDWIDE Shipping available. Buy with confidence, excellent customer service! Westminster, Maryland, U.S.A.: Random House Inc, 2001. Fine/Fine unread copy protected by Archival Brodart cover.. First Edition. Hard Cover. Fine/Fine. 8vo - over 7¾" - 9¾" tall. New York: Random House, 2001. First Edition. Hardcover. Fine/fine. New and Selected Poems. First Edition. Hardcover. Signed on the title page. LIBRARY BINDING. 1439568790 New Condition. . New. Random House. Hardcover. 0375503803 New Condition. . New. 2001-07-03. Good. Ships with Tracking Number! INTERNATIONAL WORLDWIDE Shipping available. May not contain Access Codes or Supplements. May be ex-library. Shipping & Handling by region. Buy with confidence, excellent customer service! 2002-09-17. Good. Ships with Tracking Number! INTERNATIONAL WORLDWIDE Shipping available. May not contain Access Codes or Supplements. May be ex-library. Shipping & Handling by region. Buy with confidence, excellent customer service! NY:: Random House,. Near Fine in Near Fine dust jacket. 2001. Hardcover. 0375503803 . First printing. Lower corners slightly bumped, else fine in a very near fine, price clipped dust jacket. .
NY: RANDOM HOUSE.. Fine. 2001. First Edition. Printer Wrapper. ADVANCE READING COPY. About fine in pictorial printed wrappers. (Hint of shelf wear) (B) . Westminster, MD: Random House Inc., 2001. Stated First Edition. By the Poet Laureate of the United States in the year of this book's publication. (September, 2001). Book is a landmark collection of new and selected poems. 172 pp. plus About Author. Book has white spine with gilt text, brown boards with poets monogram blindstamped on front panel. Two tiny black spots on fore edge separate this book from an 'As New' designation. It is pristine, stiff to open and appears to be unread. Unclipped (U.S.A. $21.95 Canada $32.95) DJ has bit of shelf wear, ow it too is as new. Suitable for gifting. Bookseller's Inventory # 133491.. First Edition, Fifth Printing. Paper Covered Boards. Fine/Fine. 8vo - over 7¾" - 9¾" tall. New York: Random House Trade Paperbacks. Very Good. (2001). Paperback. 0375755195 . Signed by the Auhtor on the title page. Paperback, Very Good. .
New York: Random House, 2005. 8/21/2018. Fine/Fine. First edition. Fine in fine dustwrapper. Inscribed by the poet. RANDOM HOUSE. New. 8 x 5.3 cm. New York: Random House, 2001. 12/4/2009. Fine. Uncorrected proof. Printed laminated wrappers. Fine. Random House. Hardcover. 0375503803 Like New Condition. . Fine. Random House, 2001. (4th) Slightly smaller book, white and brown boards with initials embossed at top front, gilt very bright on spine, 172 lightly browned pages plus brief biographical note. DJ has vellum-colored background beneath mylar, color-illustration on front of John Singer Sargent's "Le Piano Noir." DJ has tiny tear at bottom back edge. Near Fine DJ/Very Fine book.. Hard Cover. Fine/Near Fine. Random House, 2001-09-01. Hardcover. Like New. Collins signed and dated (title page) as new clean tight and bright in like jacket now in mylar. Please email for photos. NY:: Random House,. Fine in Near Fine dust jacket. 2001. Hardcover. 0375503803 . First printing. Fine in an about fine (trace rubbing on rear panel) dust jacket. .
New York: Random House, 2001 Random House, 2001. Very Good. Random House, 2001. Very Good. 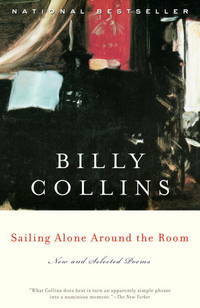 Billie Collins (1941-) was the Poet Laureate for the United States from 2001 to 2003. This volume is a collection of the best of the poets four previous collections plus new material. Stated First Edition with the full Random House number line. Dark brown paper boards bound at spine in white; blind stamped initials on front board and gold lettering on spine. No markings inside or out, but a dedication to previous owner in pencil has been erased. Unclipped dust jacket has no bumps, tears, or darkening. 172 page plus biographical notes. New York: Random House Trade Paperbacks, 2002. First Softcover Edition 5th or later Printing. Soft cover. Fine. 172 Pp. Trade Paperback Edition, Sixth Printing. Inscribed By Author. Fine. New York: Random House, 2000. Unfortunately, there is highlighting in some of the text of the book, but the book is Boldly signed "To Sondra . . . " on title page; 172pp.. Inscribed and Signed By Author. Tenth Edition. Hard Cover. Very Good/Very Good +. Random House, 2001-09-01. Hardcover. Very Good +/None as issued. Clean, solid copy with unmarked text. Cover has light handling wear; looks very good. Binding is tight and square; no creases to spine or cover. Books that sell for $12 or more ship bubble wrapped and boxed; under $12 in a bubble mailer. Expedited and international orders may ship in a flat rate envelope rather than a box due to cost constraints. All US-addressed items ship with complimentary delivery confirmation. Random House Trade Paperbacks. PAPERBACK. 0375755195 Special order direct from the distributor . New. Random House. Fine in Near Fine dust jacket. 2001. 1st Edition; 1st Printing. Hardcover. 0375503803 . Hardcover with dustjacket, first printing as indicated by the publisher's "2" in the number line on copyright page (this publisher did not use a "1" at this time) Book and jacket are in in excellent condition, no remarkable flaws, original price is present and a professional (removable) mylar cover is included, also included with this copy are copies of a couple of reviews of the book; 172 pages . Random House Trade Paperbacks. PAPERBACK. 0375755195 signs of little wear on the cover. . Very Good. Random House, 2001-09-04. 1. Hardcover. Used:Good. New York: Random House, 2001. First edition, as stated. Hardcover. Fine/near fine. 6 x 9 in. Paper boards. Condition is FINE ; like new on all points. DJ is NEAR FINE ; clean but rubbed. Poetry. Stax. New York, NY: Doubleday and Company. Very Good in Very Good dust jacket;. 2012. First Edtion; 1st Printing. Hardcover. 0385536313 . ; Small 4to 9" - 11" tall; 396 pages; First Edition, Mylar Cover on dustjacket, Dust Jacket shows little wear of usage, Book Tight, Text is clean no markings seen. .
New York: Random House, 2001. 1st printing.. Trade paperback in color illus wraps.. As New.. 'Wonderful collection by America''s poet laureate. Mint new copy.' 5-1/4 x 8, 172 pp. Westminster, Maryland, U.S.A.: Random House Inc, 2001. First Printing. Softcover. Fine. Advance Reader's Copy with separate letter from Random House to accompany it, (besides the printed letter on the first page). New York: Random House Inc, 2000. Advance Reader's Edition.. First Edition. Soft Cover. Fine. Advanced Reading Copy (ARC). New York: Random House, 2001. Hardcover. Fine/fine. NY: Random House, c2001. 4th printing. 172pp. 8vo. Fine bright looks unread hardcover in fine d/j. NEW YORK: RANDOM HOUSE. VG IN WRAPS. A FEW TURNED CORNERS. LIGHTLY WORN. Pages: 172. . 2002. LATER PRINTING. TRADE PAPERBACK.. Condition: VG IN WRAPS. A FEW TURNED CORNERS. LIGHTLY WORN. Pages: 172. Random House Trade Paperbacks. PAPERBACK. 0375755195 *LIKE NEW* Ships Same Day or Next! . Fine. Random House Trade Paperbacks. PAPERBACK. 0375755195 *BRAND NEW* Ships Same Day or Next! . New. LIBRARY BINDING. 1439568790 Very Good Condition. Tight and Neat. Five star seller - Buy with confidence! . Very Good. Random House Trade Paperbacks. PAPERBACK. 0375755195 Remainder mark . Fine. Random House Trade Paperbacks, 2002-09-17. Reprint. Paperback. Used:Good. Random House 2001. Super octavo hardcover (VG) in d/w (VG-), rubbing on dustwrapper, slightly grubby; all our specials have minimal description to keep listing them viable. They are at least reading copies, complete and in reasonable condition, but usually secondhand; frequently they are superior examples. Ordering more than one book will reduce your overall postage cost. Random House Trade Paperbacks, October 2002. Trade . 3.1 PB standard 50%.